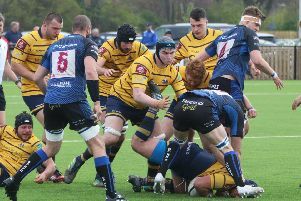 TWO former Worthing Raiders Rugby Club players are in England’s starting line-up for the RBS 6 Nations match with Scotland at Twickenham on Saturday (4pm). Joe Launchbury retains his place in the side, while Joe Marler replaces Alex Corbisiero in one of two changes from the side that started against New Zealand in December. The other change sees Gloucester centre Billy Twelvetrees come in for Manusamoa Tuilagi. Dylan Hartley, Toby Flood and David Strettle come on to the replacements’ bench for David Paice, Freddie Burns and Jonathan Joseph respectively. England head coach Stuart Lancaster said: “We are happy to stick with the team that did so well against New Zealand, especially in light of the fact that they have all been in good form for their clubs since then. “There were some very tight calls, with some experienced players coming back into contention, and I am sure the bench will have a significant impact on the game. England team: 15, Alex Goode (Saracens, 6 caps); 14, Chris Ashton (Saracens, 29 caps); 13, Brad Barritt (Saracens, 11 caps); 12, Billy Twelvetrees (Gloucester Rugby, uncapped); 11, Mike Brown (Harlequins, 11 caps); 10, Owen Farrell (Saracens, 12 caps); 9, Ben Youngs (Leicester Tigers, 28 caps); 1, Joe Marler (Harlequins, 5 caps); 2, Tom Youngs (Leicester Tigers, 4 caps); 3, Dan Cole (Leicester Tigers, 35 caps); 4, Joe Launchbury (London Wasps, 4 caps); 5, Geoff Parling (Leicester Tigers, 12 caps); 6, Tom Wood (Northampton Saints, 13 caps); 7, Chris Robshaw (Harlequins, capt, 12 caps); 8, Ben Morgan (Gloucester Rugby, 9 caps). Replacements: 16, Dylan Hartley (Northampton Saints, 42 caps); 17, David Wilson (Bath Rugby, 22 caps); 18, Mako Vunipola (Saracens, 4 caps); 19, Courtney Lawes (Northampton Saints, 15 caps); 20, James Haskell (London Wasps, 45 caps); 21, Danny Care (Harlequins, 37 caps); 22, Toby Flood (Leicester Tigers, 53 caps); 23, David Strettle (Saracens, 12 caps).